100 New Yorkers Engage in "V-day Kiss"
On August 14th,(New York Time), the " V-day Kiss" recured at Times Square in New York. Approximately 100 New Yorkers gathered at the square to observe the victory of the Second World War by kissing each other. It is said that on August 14th 1945when Japan announced his unconditional surrender, New Yorkers flocked to the streets to celebrate the victory. A marine kissed a nurse beside him, this flash was filmed by a photographer and became a classic photo. Love is actually everywhere, isn't it? In the second photo they are not lovers. For this new one, it is hard to tell. 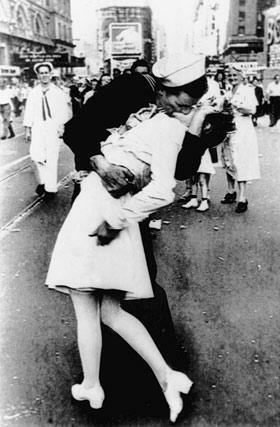 The sailor in the original picture was quite a kisser and swept the nurse right off of her feet. That's why that picture is so famous. Right, GRIZ326, "the sailor in the original picture was quite a kisser". But I think the picture is so famous, not because he was a good kisser, but because it witnessed the history, and recorded that sacred moment. You cant beat a good kiss, the best I've had was a " French Kiss " it lasted 30 minutes before we needed a breather. Wow, West,30 minutes. You must have an amazing lung vital capacity. Do you feel very happy and excited when you recall the sweet kiss? I guess you must be. Post a Reply to: 100 New Yorkers Engage in "V-day Kiss"